Home / HIGH SCHOOL / BASKETBALL / Why not us? One simple question has been driving the Sacred Heart girls basketball team all season. This year’s Lady Cardinals squad became the first team in its girls basketball history to win an area championship when they topped Ohatchee 49-28 Saturday night. Sure, they had to move away from an area and classification with Class 1A power Spring Garden to do it, the result of their phenomenal success on the boys side, but the Lady Cardinals (23-4) established themselves as the best in 2A Area 11 by sweeping through their area schedule and then smothering Westbrook Christian and the Lady Indians in the tournament. They go searching for their first trip to the Northeast Regional on Monday when they host LaFayette in the sub-region round of the state tournament. Ohatchee (12-14) will travel to Ranburne. “This means a whole lot, this is the kind of stuff people cut nets down for, so it’s a big deal for us,” Sacred Heart coach Marcus Harrell said. “I challenged the girls tonight. I told them eventually there’s going to be a team that’s the first. We’ve never had a team win the area championship, we’ve never had a team to host the area, we’ve never had a team to host a sub-regional game. There’s eventually going to be a team to be the first, why not us? Why don’t we be the first one to do it. 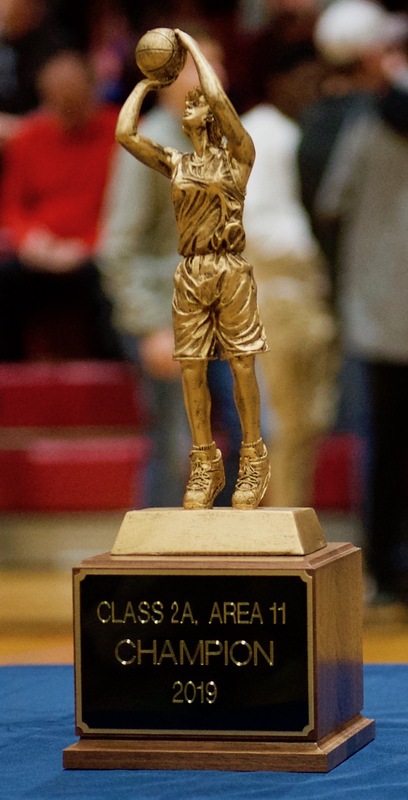 Ayanna Foster was the tournament most valuable player. 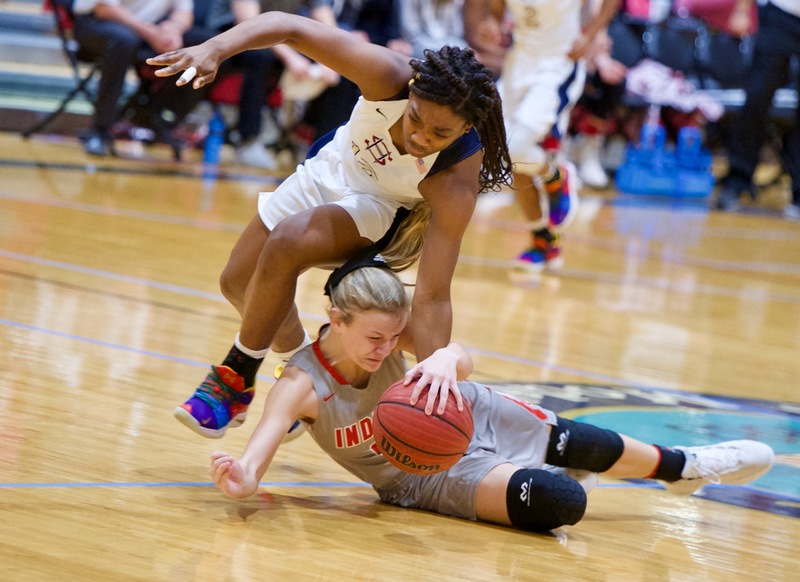 She scored 24 points against Ohatchee, 16 in the second half after sitting out virtually the entire second quarter after picking up her third foul. With Foster out of the lineup, Ohatchee held the Lady Cardinals to six points and closed its deficit to four before Alisia Person hit a 3-pointer right before halftime. It was the closest the Lady Indians would get to an upset. Foster got back in the game in the second half and simply took over in the third quarter. The Lady Cardinals held Ohatchee scoreless for nearly the first five minutes of the second half. Meanwhile, Foster scored their first six points of the quarter and their last four as the lead went to 20 points for the first time. Sacred Heart’s defense was relentless throughout the game. It forced the Lady Indians into 26 turnovers off which the Lady Cardinals scored 22 points. OHATCHEE (12-14) – Gracyn Snow 1 0-1 2, Jazmine Adams 2 0-0 5, Tori Vice 4 2-4 10, Gracie George 1 0-0 2, Millie Rainwater 0 0-0 0, Regan Snow 0 0-0 0, Jorda Crook 3 3-9 9. Totals 11 5-14 28. 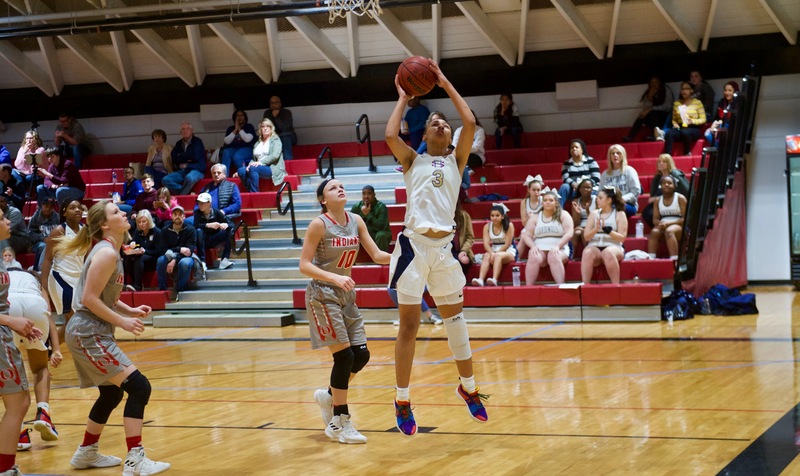 SACRED HEART (23-4) – Alisia Person 2 0-0 5, Myiah Harris 2 0-0 5, Ayanna Foster 12 0-1 24, Joelle Tillery 0 0-0 0, Jordan Sabree 3 0-0 6, Serena Hardy 1 0-1 3, Taysia West 2 0-0 6. Totals 22 0-2 49. 3-point goals: Ohatchee 1 (Adams); Sacred Heart 5 (Person, Harris, Hardy, West 2). Total fouls: Ohatchee 11, Sacred Heart 15. Officials: Baker, Simpson, Thomas.